Some Broomfield mineral owners began receiving notices this past week from Extraction Oil and Gas dated August 13 with the heading: “RE: Notice of Intent to Propose Rule 318A.a. (4)D Horizontal Wells.” Since the letter continues the pattern of obscure, confusing communication from Extraction, Wildgrass residents began investigating the meaning of the letter. The letter asks for mineral owner signatures to approve the spacing unit and waive a COGCC rule allowing for a 30-day written objection period. 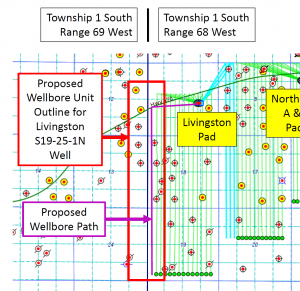 Extraction seems to be following COGCC exception rules to apply for a new 800 acre narrow spacing unit in order to drill a boundary well off the Livingston Pad in a path along the western edge of the Lowell South Spacing Unit. 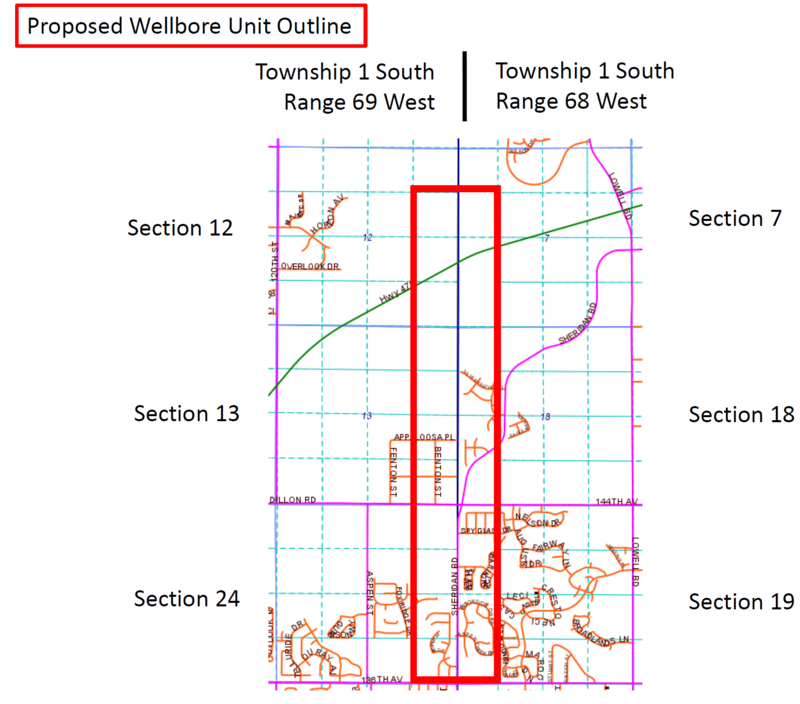 The COGCC treats such boundary wells as exceptions in order to prevent one operator from extracting minerals outside their approved spacing unit. Please see the map at this link and to the left, which seems to indicate that the spacing unit would extend into Boulder County. 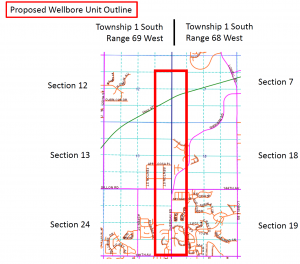 The Wildgrass Oil and Gas Committee (WOGc) has been assisting mineral owners in understanding how to deal with obscure notices regarding the Livingston Pad for two years. If you think you live in the affected area or received a similar notice from Extraction, please reach out to WOGc at wildgrassogc@gmail.com for further information. Please see the map at this link and to the left which gives an overview of the impacted streets for this well. There is also a more detailed set of maps at this link, provided by the COGCC’s Jane Stancyzk after an inquiry from WOGc. According to the Form 2A and Form 2 drilling permits approved by the COGCC on June 1, Extraction was permitted to drill up to 19 wells off the Livingston Pad but had 13 wells approved, 3 still pending and 3 for which there had been no submission or information. This week’s notice received by some mineral owners identifies the well as Livingston S19-25-1N. 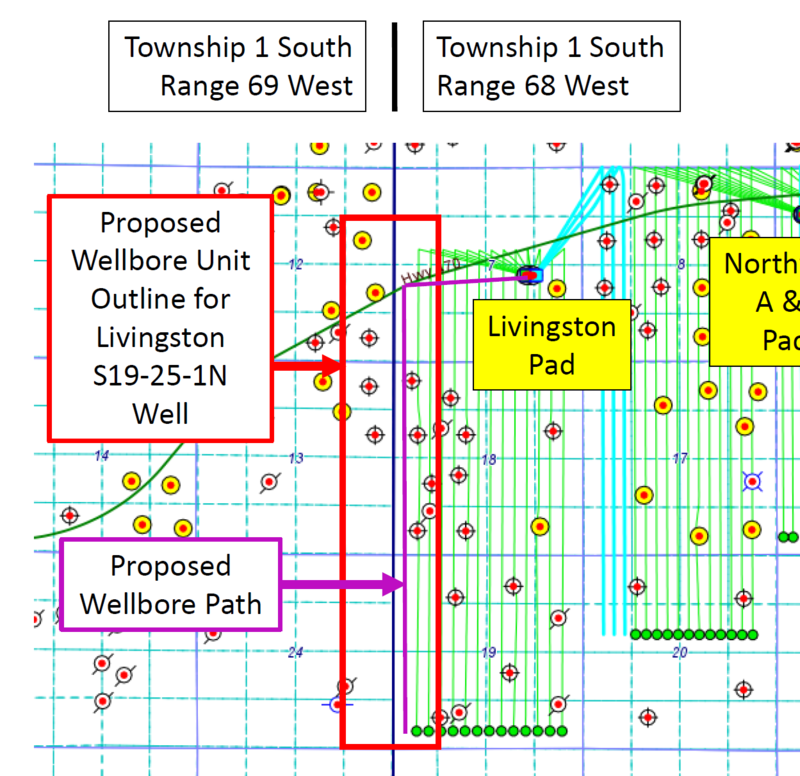 Since the lowest value of the previously permitted wells started with an identifier ending in 2N, it seems possible that Extraction may have had this boundary well planned all along. The COGCC processing of an objection to the well by a mineral owner favors the operator. According to COGCC Rule 318A(e)(5)(A), there are only four valid reasons that the mineral owner can object to the proposed spacing unit: “the notice provided by the operator does not comply with the informational requirements of subsection A., above [COGCC rule 318A.a. (4)D], and/or a technical objection that either waste will be caused, correlative rights will be adversely affected, or that the operator is not an ‘owner,’ as defined in the Act, of the mineral estate(s) through which the wellbore penetrates within the target formation.” Any objection must be sent to both Extraction and the COGCC and then the operator tries to resolve the objection with the objector. Only the operator has the authority to tell the COGCC that the objection cannot be resolved and to ask for a hearing. If there is no objection, the COGCC Director can administratively approve the well.